Independence Day is India's great national festival. It is observed annually on 15 August, commemorating the nation's independence from the British Empire on 15 August 1947. It is a national holiday in India. The day is celebrated to commemorate the birth of the world's biggest democracy. It was 15 August 1947, the historic date, on which sovereign India's first Prime Minister Pandit Jawaharlal Nehru unfolded the tricolour flag of the nation on the glorious Red Fort. The day is significant in the history of India as bringing an end to the British colonial rule in India. 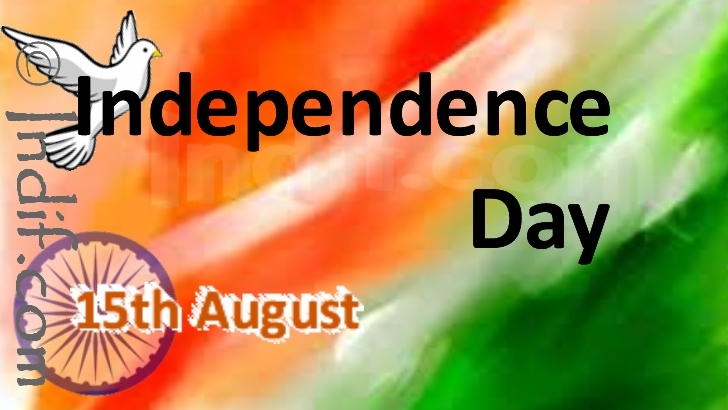 India gained its liberty and became a free country at midnight between August 14 and August 15, 1947. It was then that the free India's first prime minister Pandit Jawaharlal Nehru gave his famous "Tryst with Destiny" speech. The professed pledge was successfully redeemed on January 26, 1950, when the Constitution of India framed by the Constituent Assembly of India came into force, although the Independence from the British rule was achieved on August 15, 1947. It is because of this that August 15 is celebrated as Independence Day, while January 26 as Independence Day. To mark the importance of this occasion, every year a grand parade is held in the capital, from the Raisena Hill near the Rashtrapati Bhavan (President's Palace), along the Rajpath, past India Gate and on to the historic Red Fort. The different regiments of the Army, the Navy and the Air Force march past in all their finery and official decorations. The President of India who is the Commander in Chief of the Armed Forces, takes the salute. Patriotic songs are played. Floats (Jhaanki) from all states with colorful vibrancies are displayed. There are cultural performances by the students and professionals. The winners of the gallantry awards also take part in the parade in open jeeps. Kids, who have won National Bravery Awards, join the parade sitting on elephants. Indian Air Force helicopters fly past the parade showcasing their stunts and showering rose petals on the audience beneath. In many schools colleges and government organizations, the national flag is hoisted early in the morning; followed by cultural programs. In the States, the Governors take the salute, and in Taluqas and administrative headquarters on same procedure is adopted. At Vijay Chowk in New Delhi, three days later (i.e. 29th January) the massed bands of the Armed Forces "Beat the Retreat" in a majestic manner. The Independence Day celebrations have rightly become world famous as one of the greatest shows on earth drawing thousands of eager sight-seers from all over the country and many parts of the world. No other country can draw on such a wealth of tribal traditions and cultures, so many regional forms of dances and dress. And, no other country in the world can parade so many ethnically different people in splendid uniforms as India's Armed Forces. But they are all united in their proven loyalty to the Government elected by the people and in their proud traditions and legendary gallantry. National awards (Maha Veer Chakra, Ashok Chakra, Param Veer Chakra, Veer Chakra) and bravery medals are also distributed at this day to the soldiers of armed forces, common people and students from the school.